Dental health is related to overall health. Recent studies have identified a positive correlation between poor dental health and several systemic diseases including heart disease, oral cancer, and diabetes. Additionally, oftentimes these diseases will first show signs in the mouth. Like most illnesses, the earlier the problem is diagnosed, the more successful treatment tends to be. This makes maintaining your dental visits at least twice a year important for not only your oral health, but your overall health too. Bi-annual dental appointments are important. As we just stated, bi-annual dental appointments can help catch oral health or whole-body problems early, making treatment more successful. But there’s even more to these twice a year visits. 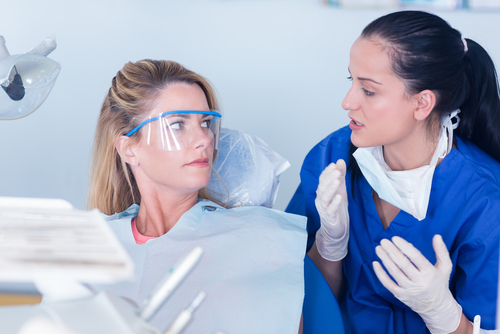 At your dental checkups and cleanings, we’ll remove plaque or tartar build up, take x-rays, talk about any changes you’ve noticed, and get you all set for another six months of great oral health. So is brushing and flossing everyday. Bi-annual dental visits aren’t the only way to help keep your smile healthy. Following a proper oral hygiene routine at home is also essential. Your dentist in Austin recommends brushing twice a day and flossing once a day to remove food particles, bacteria, and plaque. Just remember to brush gently using small circular motions to avoid damaging gum tissue. What you eat affects your oral health. A healthy diet isn’t only good for your body, it’s also good for your oral health, too. Besides following a balanced diet, you should limit sugar intake as well as carbohydrates. We all know that sugar leads to cavities, but carbohydrates can do the same. As carbs break down, they convert to simple sugars. Bacteria then feed on these sugars and produce an acidic byproduct. This acid then eats away at the protective tooth enamel, leaving teeth exposed to decay. It’s not normal for gums to bleed. Believe it or not, but seeing a little bit, or a lot, of blood in the sink after brushing or flossing is not normal. In fact, bleeding gums can be a sign of gum disease, and gum disease is dangerous to both your smile and your body. If left untreated, gum disease could lead to tooth loss, diabetes, stroke, and heart disease. Don’t ignore bleeding gums and make sure to talk with your dentist about it at your next appointment. If it’s been longer than six months since you’ve been to the dentist, we encourage you to call our Austin dental office to schedule an appointment with us today.